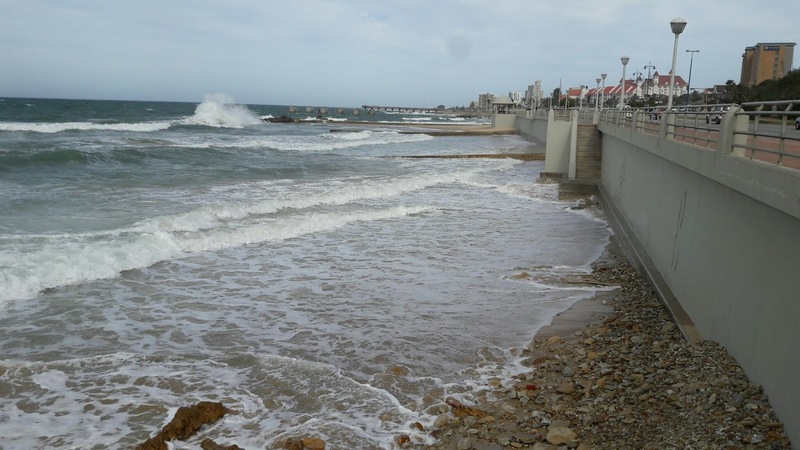 The beachfront walkway continues beyond the lollipop beacon at the bottom of Admiralty Way all the way to Flat Rocks. The section of the walk from the beacon is actually called the Humpback Dolphin Trail although you're probably more likely to see Bottlenose Dolphins swimming along the coast. The walkway in picture is the last 100 meters with Flat Rocks to the left. A group of people setting off on the very popular Sacramento Tail between Schoenmakerskop and Sardinia Bay during the late afternoon. 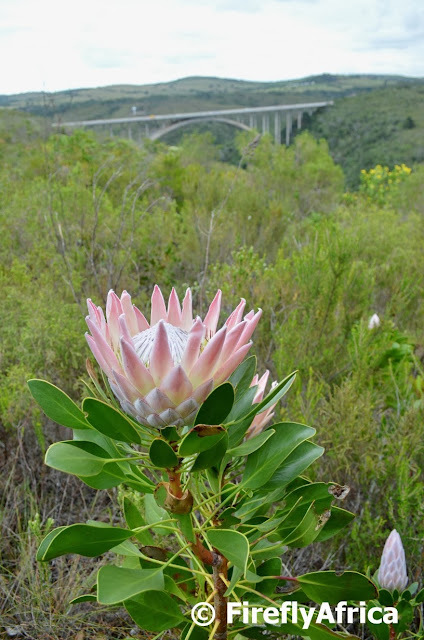 The Van Stadens Wildflower Reserve must be one of the best places around to see Proteas and other Fynbos species growing in the wild. Not just is it great to view wild flowers, but the reserve also has a number of excellent trails for you to go and stretch you legs along. The trails range from short easy walks along the plateau to longer ones that require a bit more effort down into the surrounding gorge and valleys. This week's Video Friday post is one featuring a video by Alan Straton of MyPE he uploaded after a visit to Bird Island in 2014. It shows the old Bird Island Keeper's house... with a garage. Curious? Have a look. The flowering Coral Aloes in the Karoo just north of Olifantskop was stunning again this year. 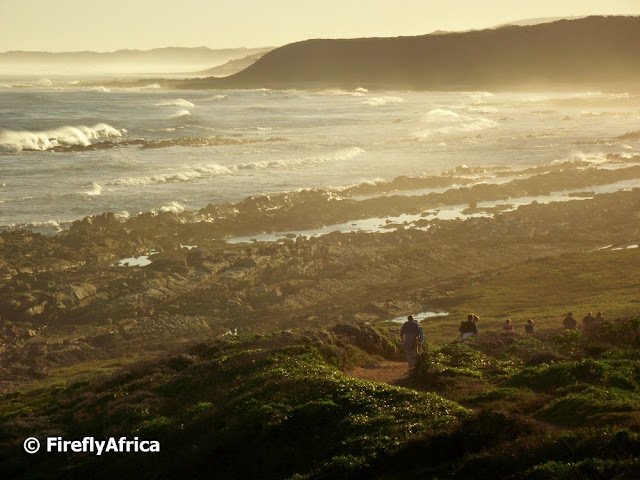 We really don't have to go very far from Port Elizabeth to see nature in all it's splendor. What is your office view like? 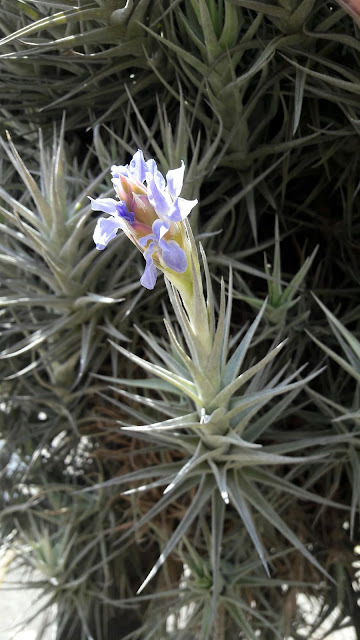 Last week I posted a picture of my air plants flowering and received quite a few questions about in, especially on Facebook. Most people asked what I do to make them flower as their's don't. 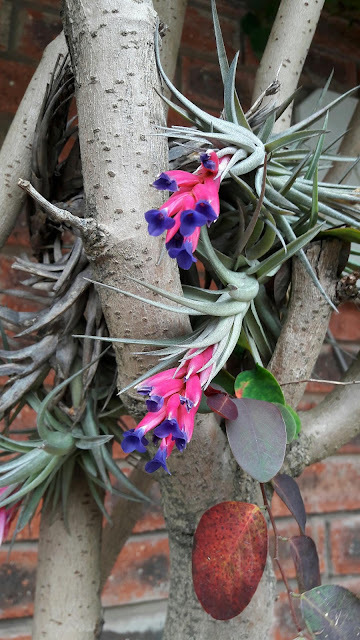 I have to types of air plants around my yard (don't ask me what they are called cause I don't know) with the one type flowering bright pink with blue every year. The other type grows quite fast forming big clumps but doesn't really flower that often. When they do flower it's usually just one blueish flower and seemingly only the one by my postbox. On Saturday afternoon when I was busy working in the yard I noticed that it's actually flowering so I snapped a pic to show you the difference. On the top photo you can just make it out at the bottom of the plant (it's very visible on the plant's shadow). 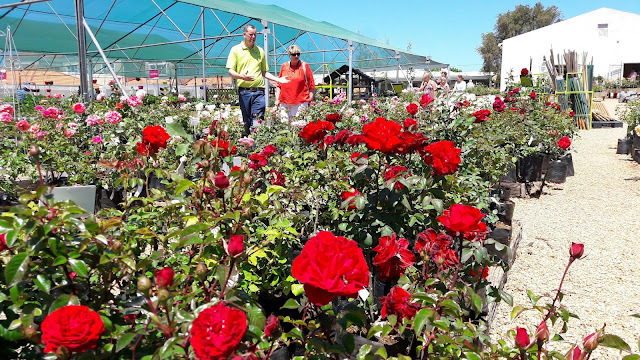 I spent most of my Saturday in the garden and feeling a little in need of gardening inspiration we headed to Floradale Nursery on Circular Drive. Now I know even less what I want to plant. Wow, the options are endless and so many plants are flowering. Going to have to plan the garden better for next spring. 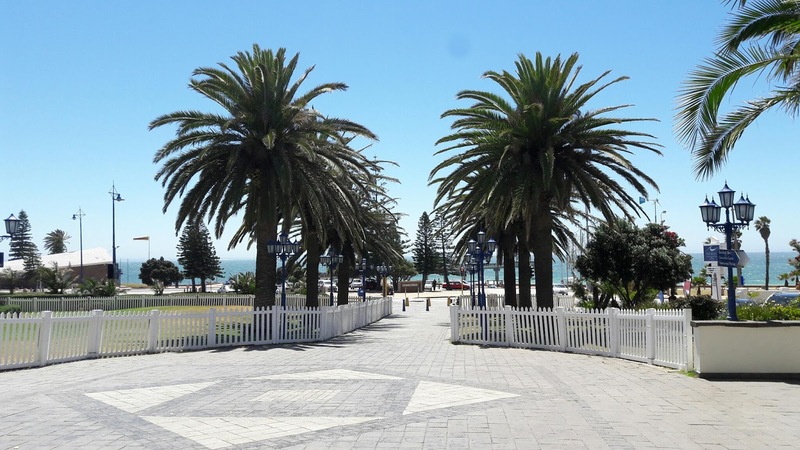 Probably one of the biggest pieces of sport news of the year broke about two or three weeks ago when Port Elizabeth and Nelson Mandela Bay was announced at hosts for the Ironman 70.3 (also known as Half Ironman) World Champs in 2018. 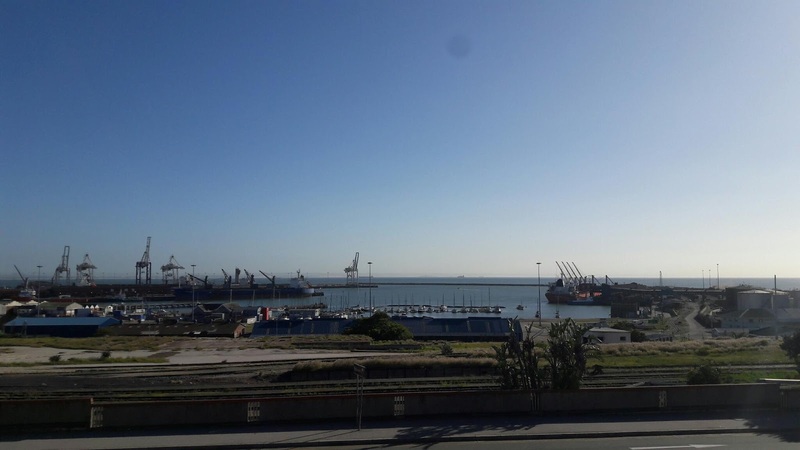 The event is even bigger than the annual Ironman African Championship that takes place in the city and attracts over 3 000 competitors from around 70 countries along with all their families, supporters as well as international media. It also takes place over two days with the women competing on 1 Sept 2018 and the men on the 2nd. Huge news for the city and a boost for tourism with the international exposure we will receive in addition to the money that will be coming in along with the competitors and their supporters. Check out this awesome promotional video they have put together for the announcement. 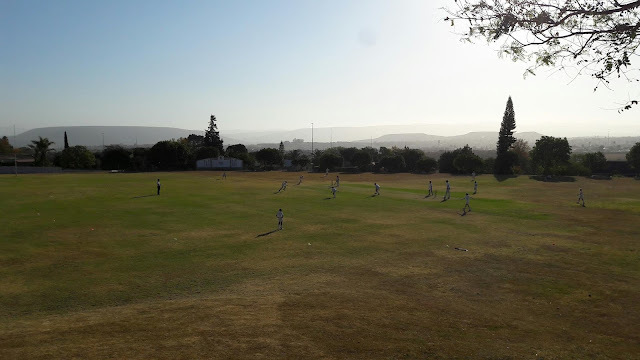 This afternoon Drama Princess played cricket at Handhaaf Primary School in Uitenhage. The view from up at the clubhouse is actually quite nice with the mountains in the distance. Much better than the view from most other schools. I don't have big flowerbeds in my garden. For that I just don't have enough time and green enough fingers. 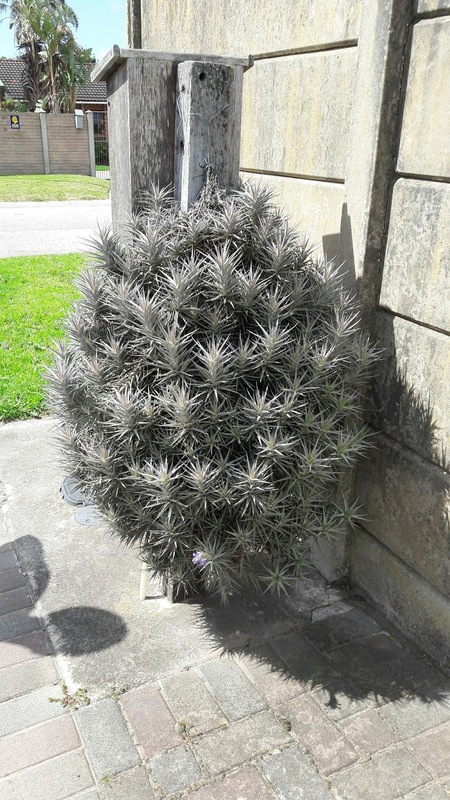 I do have a few different plants and lots of succulents though and one of those I probably get most excited about when they flower is my air plants. Air plants (Tillandsia) is a member of the Bromeliad family and is actually very easy to grow. 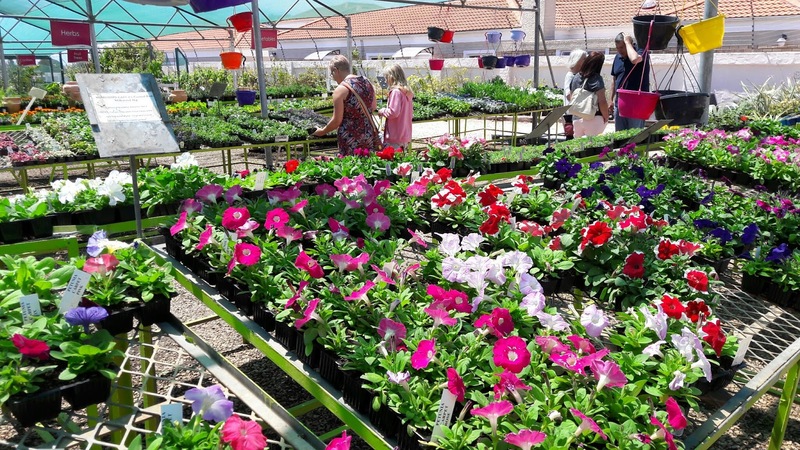 They don't need soil and you only need to water them slightly (like in with a spray bottle). You can keep them both inside (in a well lit area) and outside although they don't always like to be in full sunlight all the time. I have two types of air plants in my garden. The type in the picture flowers every year while the other type makes big clumps yet doesn't really flower other than a single light purple flower and not even every year. I'm sure everybody in PE would agree with me that we are slightly tired of wind. It's been blowing just about nonstop for close to a month now so it was great to walk outside just now and realising that there is absolutely now wind blowing. So not to jinx it I just want to say. I woke up in Johannesburg this morning after last night's Lilizela Tourism Awards and looking out from my hotel rook the sky was hazy and there was lots of smog and smoke clearly visible along the horizon. Standing there I was actually glad that we get wind in PE that keeps our air clean from air pollution. But you would agree, sometimes enough is just enough. The Lilizela Tourism Awards organised by South African Tourism and hosted by the Minister of Tourism, Derek Hanekom, took place in the Sandton Convention Centre in Johannesburg tonight (16 October 2016). This year I was invited to be one of the judges for the third year in a row and it really is a great privilege to be asked to be part of the adjudication process. 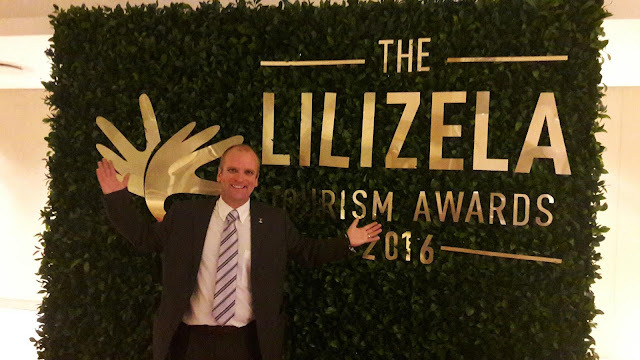 The Lilizela Awards are South Africa's premier tourism awards and those products who walk away with the awards on the night truly are the best of the best. The Eastern Cape shined on the evening, walking away with eleven awards. The Nelson Mandela Metropolitan University choir really showed their worth at the recent Varsity Sing choir competition up to where the judges screwed them over in the final placing them fourth where they should have ended second at worse. But let's not show sour grapes cause sour grapes do not make good wine. Anyhow, I wanted to share two of their performances from the semi finals with you today. The first their rendition of Queen's Bohemian Rhapsody and then below, their Mandela-Medley. I had to stop at the Spar in Humerail this morning and stopped to admire the view of the harbour from the parking area. Some people wouldn't term this as a beautiful view but I like to call it an interesting view. Unfortunately I didn't have my camera so a cell phone photo will have to do. 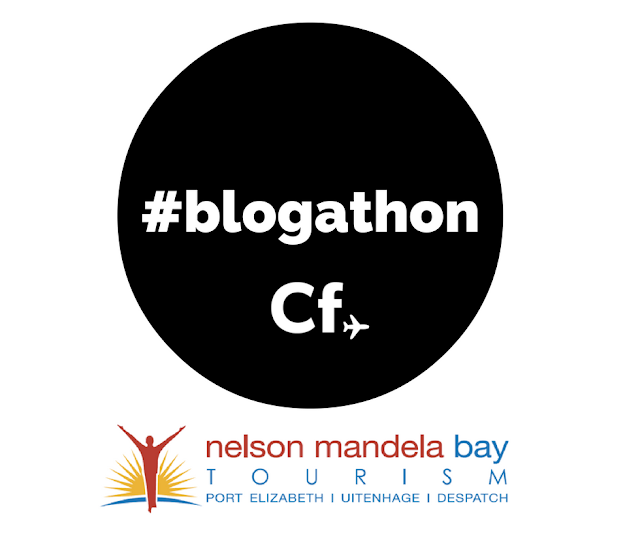 I was invited to participate in the #SharetheBay Port Elizabeth #Blogathon 2016 campaign in collaboration with Cheap Flights, Nelson Mandela Bay Tourism and Travel Concept Solution this week. As one of eight bloggers taking part I decided not to do the usual "Things to do in PE" kind of blog but rather focused on my favorite nine walks and hiking trails around Port Elizabeth. 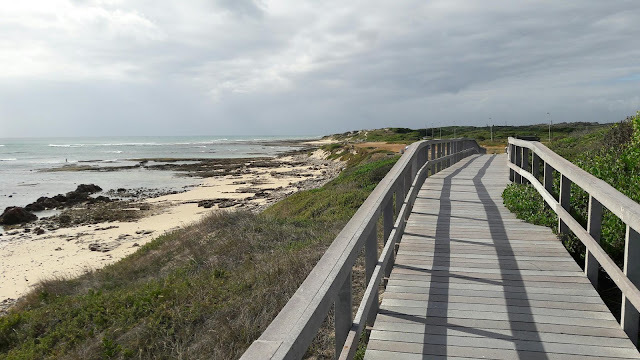 The post covered the beachfront boardwalk, Sacramento Trail, Coastal Fynbos Trail, Roseate Tern Trail in Cape Recice, the Grysbok Trail in the NMMU Nature Reserve, the Baakens Valley, The Island Nature Reserve, Van Stadens Wildflower Reserve and Sleepy Hollow. 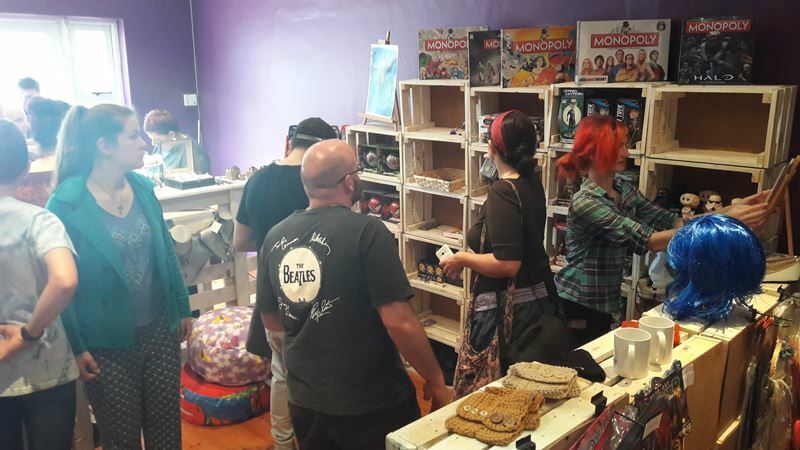 I'm not going to repost the whole post here, but do head over to Firefly the Travel Guy if you want to read it. Another flower picture sent to me by Gerhard Burger, this one of a Hadida Ibis between the flowers. Wonder if his name is Petal the flower (bird) child? 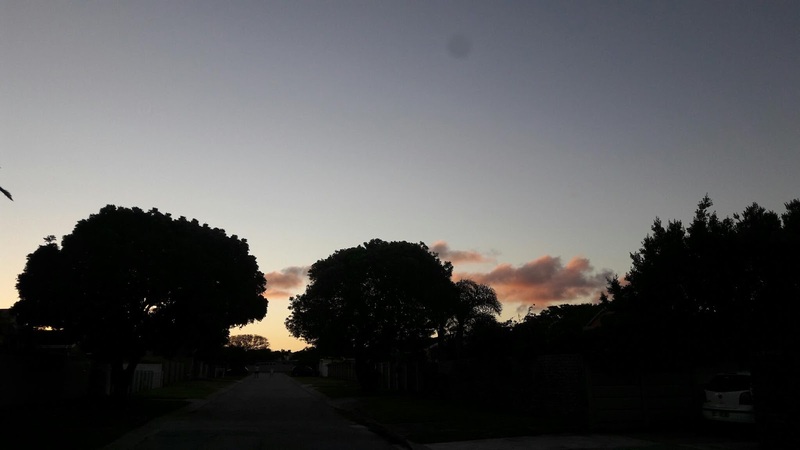 Picture taken in Glendinningvale. About two weeks ago I received a mail from regular PE Daily Photo follower Gerhard Burger (and apologies to Gerhard for not replying but my laptop has packed up and I haven't been able to reply to emails from my phone. At least I've been able to upload the pic from my phone to the blog). He took this picture in one of the parks in Glendinningvale. Much cheaper to view flowers in PE like this than to travel to Namakwaland. 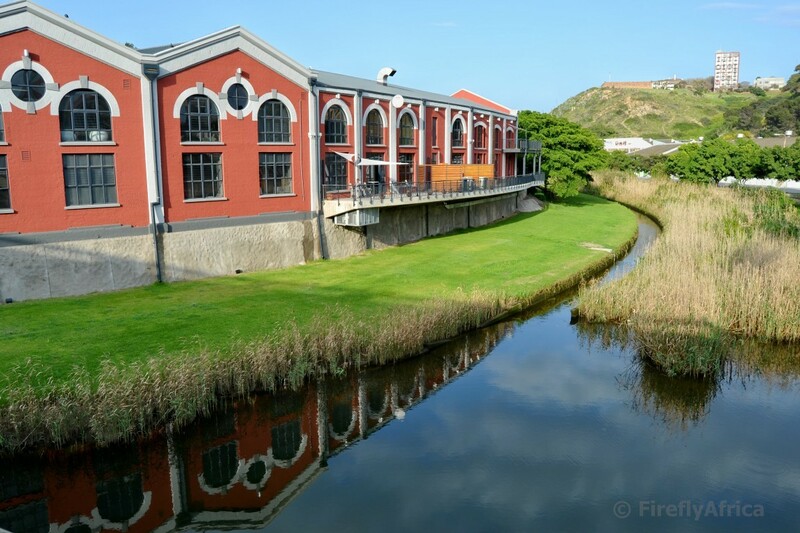 The newly restored Tramways Building reflecting in the Baakens River. Truly an old yet new landmark in Port Elizabeth. Can you see Fort Frederick on the hill in the background? I quick drive around Richmond Hill the other day had me stop in front of the Jewish Pioneer Memorial Museum in Richmond Hill. Standing there I realised that I have actually never been inside the museum so I can't really tell you what is inside from a first hand perspective. I can tell you this though. 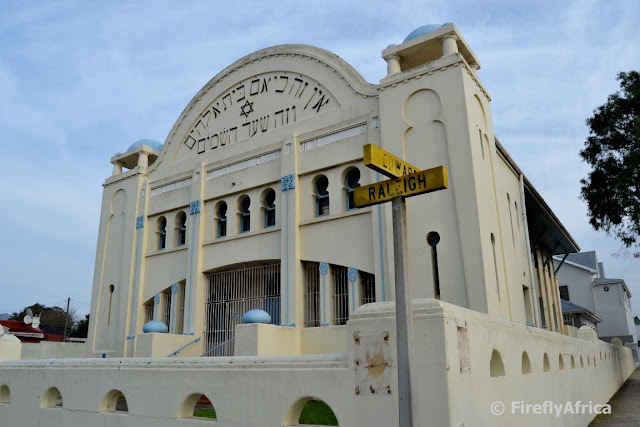 The museum is housed in the original synagogue which was used by the Jewish community between 1912 and 1954. The museum features a collection of memorabilia, ceremonial items and historical photographic displays such as a bridal gallery, Jewish ex-servicemen memorial and much more. It is only open by appointment though which is probably the reason I've never had the opportunity to visit. 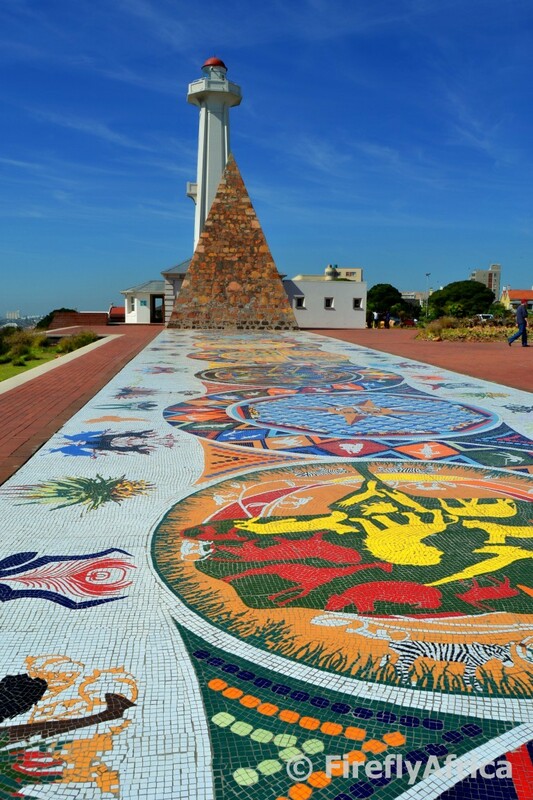 The Piazza Mosaic next to the Donkin Pyramid is one of the most impressive art pieces making up Route 67 on the Donkin Reserve. The 470 square meter mosaic was made by a NMMU ceramic collective and depicts the Port Elizabeth and the Eastern Cape's cultures, heritage, diverse histories and abundant of fauna and flora. I actually find that every time I look at it I notice something I haven't done before. 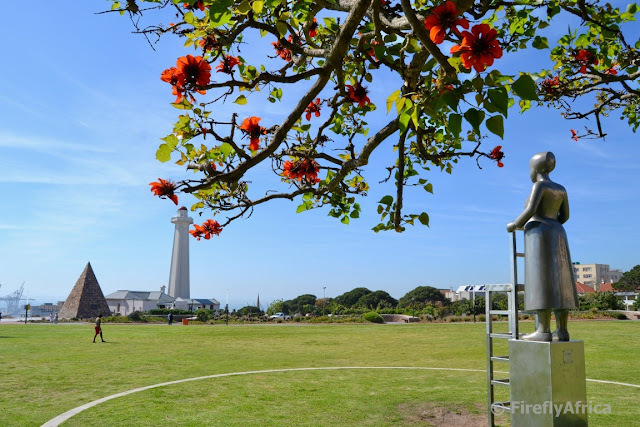 Looking across the Donkin Reserve from the lady with the chair Untitled art piece with the flowers of one of the Coral Trees in the foreground. After nearly two weeks of wind I wonder how many flowers there still are on the Coral Trees around town. 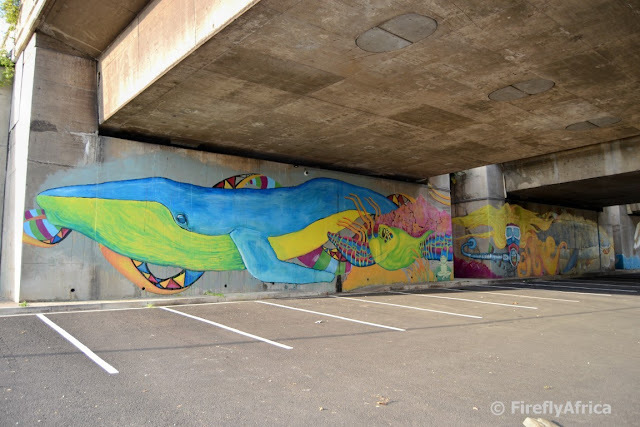 If you drive from the city centre up towards Humewood you pass under the freeways before passing the Green Mosque. 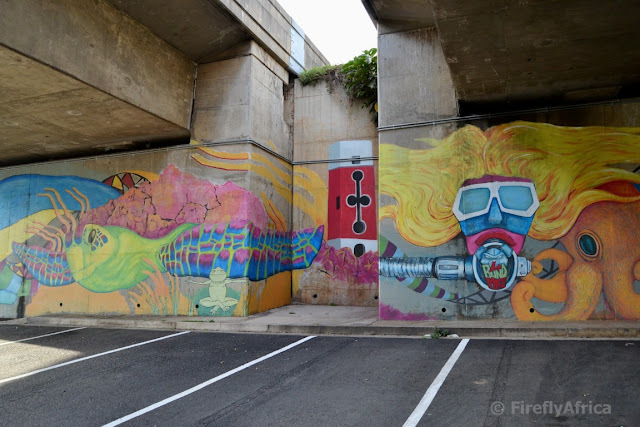 A few months ago a brand new art piece appeared on the wall next to the parking area under the freeway. I've been glancing at it every time I passed but a week or two ago I got a chance to have a closer look. 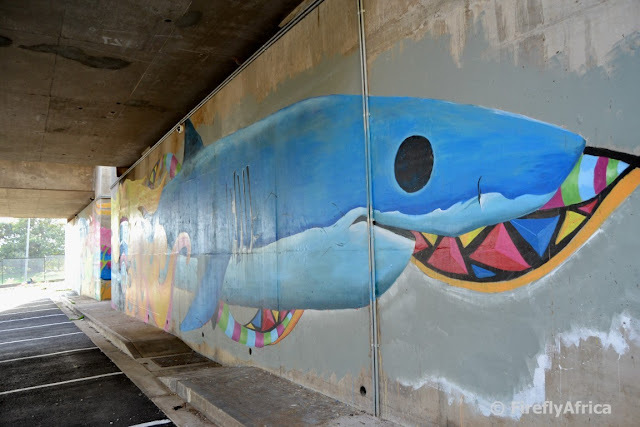 The piece by 3 Bind Mice depicts a marine theme, very apt for Port Elizabeth and Algoa Bay. It's really great to see PE's street art culture growing like this with the support and blessing of the municipality and MBDA and with the additions of pieces like this PE is going to hopefully soon take its place next to Newtown and Maboneng. I was invited to be the speaker at the first Port Elizabeth #TravelTalk event hosted in Port Elizabeth by Urban-Econ which took place at the GFI Art Gallery this week. 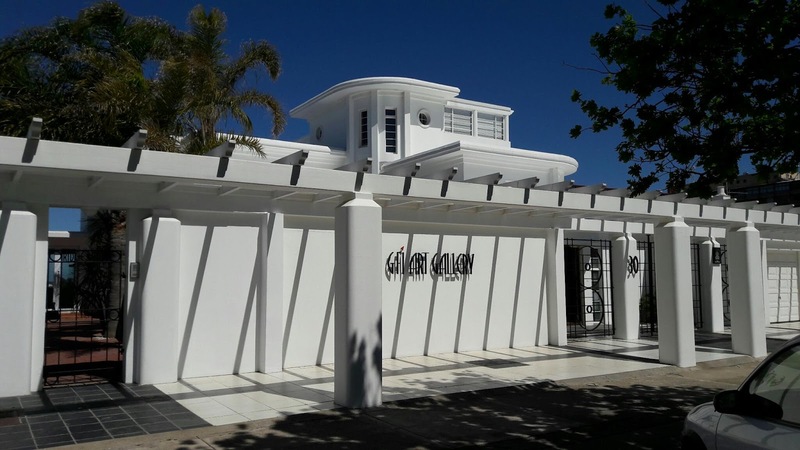 The GFI Gallery, previously known as the Ron Belling Art Gallery, have recently seen a big renovation and expansion and is looking stunning. If you haven't been recently then it's worth the visit.